To efficiently and effectively managing your content, Zem Media will have the perfect solution for you! Our core standards combined with our unique experience allows us to deliver an easy-to-install, easy-to-use dependable digital signage solution. The Zem Media Digital Signage Solution can be scalable to a comprehensive end-to-end package. Zem Media can provide the necessary equipment along with training, installation services and content development services based on your companies specific needs. It’s our flexible and agile software combined with our unique view of the industry that sets Zem Media apart from other companies. You can manage your own content or have Zem Media manage it for you! There are many ways to make use of your digital marketing easily and effectively. Zem Media has a deep understanding of what it takes to make you look good! Our strategies are driven by the desire to make your final solution IMPRESSIVE, SHARP and UNIQUE! It's not enough to display compelling artwork and messages, brand is also relevant! Our unique "layers" approach to content creation allows you to take basic content and spruce it up with Video Avatars, Special Effects, or simply Full Screen Video. Standardize business expenses and minimize wasteful spending while increasing the effectiveness of your marketing. The Zem Media portal and player are "experience-designed" and “purpose-built” to meet these requirements. Nearly two decades of digital media and content management experience has given us the "real world" experience allowing us to optimize effective content delivery and media display methods. 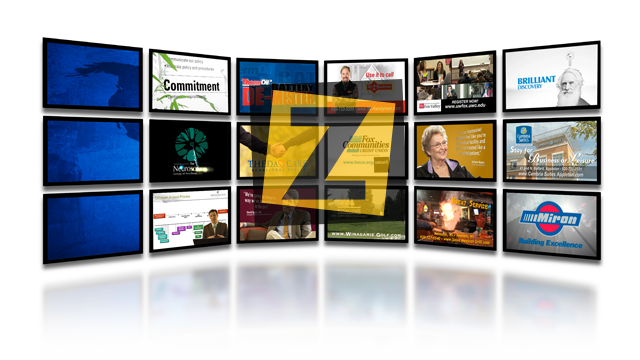 Our unique management system allows the end-user to easily send content to multiple devices all at once while the "Content Layered" Zem Media Player displays the results in a highly desirable, mixed media display. What is the Zem Media Solution? " THE MULTI-LEVEL CONTENT DELIVERY WITH DISPLAY MADE EASY!" Have the luxury of a well-informed, highly technical, marketing department and often have to outsource various functions to costly marketing firms or place the responsibility with inexperienced employees. Zem Media now makes it possible to have your artwork "Designed to Get Attention" using: premade video avatars, on-screen video widgets, or your own creative media. Change out any one of the three layers without effecting the other two, or use only the single layer approach. It’s up to you or your staff. The flexible and easy to use solution is designed to meet your specific needs and abilities!